The recent visit to Pakistan by the U.S Special Envoy Richard Holbrooke and Admiral Mike Mullen highlighted the growing differences between Pakistan and the United States on how to tackle the threat of Pakistani Taliban. At another level, their visit also signified an emerging consensus between Pakistan’s political leadership and security establishment that it can not afford to give in to the U.S. demands and need to chart a different course. As a recent Dawn editorial noted, the visiting U.S. team was taken aback by the tone of Pakistani officials. Instead of arm-twisting Pakistan into agreeing to joint military operations in the tribal areas, they were confronted with a barrage of criticism and the visit ended with a rare and public acknowledgment of the differences between the two sides. While the PML-N chief Nawaz Sharif has been forceful in his opposition to these attacks for quite some time, it appears that the Prime Minister Gilani, President Zardari and the COAS Gen. Kiyani has finally thrown their weight behind this argument. Also a recent report from the bipartisan National Security committee condemned such attacks in the “strongest possible manner”. 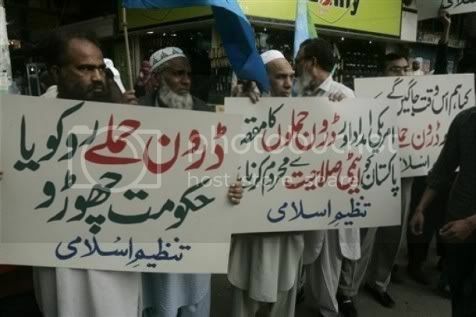 Ironically its the Americans that deserve most of the “credit” for causing this convergence of thinking in Pakistan. A sustained campaign of charges in the U.S. press against the ISI for its alleged links with militants led by the senior U.S. Generals coupled with the threat of an expansion in drone attacks to cover Baluchistan and settled parts of Pakistan has finally convinced the national leaders to come out against the U.S. plans. Pakistan is also frustrated at the United States for its failure to make Pakistan’s strategic interests in Afghanistan a part of its new strategy for the region. The magazine pointed out that only a large-scale invasion could eliminate al Qaeda from the region but such an invasion was impossible and therefore there was little reason to continue the drone attacks. â€˜US military strikes in Pakistan â€”even limited ones â€”tend to undermine the Pakistani government and increase the risk that Pakistan will become a failed state,â€™ the report noted. Is there anything new here? 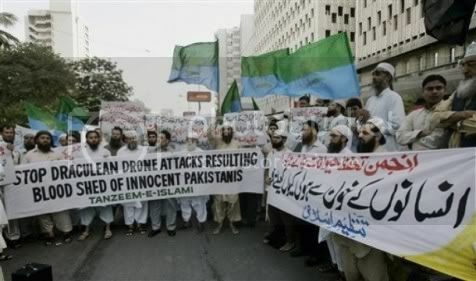 Bluster from Pakistani leaders about drone attacks are a dime a dozen. I believe both Zardari and Kiyani have opposed the attacks in the past. It would be political suicide to do otherwise. Pakistan has an ineffectual-bloated military establishment that would be unaffordable without foreign ‘aid.’ Even with massive foreign aid, the military that appears unwilling and incapable of establishing the writ of law consumes a third of the entire government budget. What do we all get for this huge expense in treasure and sovereignty: fancy military cantonments for the enlisted, shiny hospitals for the families enlisted, better-than private education for the children of the enlisted, and easy access to foreign travel, visas to the West, and frequent UN peacemaking mission junkets to Bosnia, Liberia, etc. I am not hopeful. American drone attacks will enrage the public, destroy any remaining authority the government clings to, and the government which was always a shell organization doling out protocol and satrapies will be exposed for what it is: a double-dealing cesspool of deceit and incompetence. There is no way in hell that Pakistan is going to win any war against anybody — the militancy will grow in potency, the army and police will retreat further, and those who can, will flee for there lives. Americans seem perpetually to underestimate the depth of public and official antipathy to everything about them and they wrongly assume that accepting American money might signal a willingness to adopt an American agenda. Pakistanis wrongly assume that taking American money while enabling America’s enemies will do no harm to their homeland, the contradictions in these points of view are now manifest. It is easy to feel indignation against the drone attacks….they just fit too neatly in our national “foreign hand” theory of denial. Any esteemed politician or a self-righteous maulana can get away by blaming the obvious intransigence of drone attack as the cause of social upheaval and suicide bombings. The phrase of “drone hamla” is so often used that it somehow doesn’t even feel foreign; it has been absorbed in Urdu. Yet we overlook the 800lb gorilla of drone attacks: the attacks are not the cause, they are an effect of a nation having no control over its domain. Eliminate this cause by establishing sovereign control of FATA and you will eliminate the need for drone attacks. Until then happens, they are a relatively better solution than just plain ol’ B-52 carpet bombing. According to them the drone attcks are happening with the tacit approval of the Pakistani government. Pakistani intelligence selects many of the targets, and the planes fly from a Pakistani airbase. Todays edition has a chilling article about how the Taliban are advancing by strategically creating a rift between the landlords and the workers on the land. In Swat they kicked out (killed or intimidated) dozens of the most powerful land-owners and use the poor subservient workers to bolster their own forces. This strategy will probably be used in Punjab as well. We are losing the war. Most of us don’t even realize it, perhaps. Why else would the government make a “deal” with the Taliban? The drone attacks did not start overnight or without any warnings. Pakistan’s government was given dozens of opportunities to control the situation that was fast becoming a nightmare for the whole world. All Pakistani security forces did was retreat from every inch, got the Pakistani soldiers slaughtered or kidnapped and signed numerous “deals” from the position of weakness, the results of that are for everyone to see. I do have one question for the flag barriers of “honor” and “sovereignty”. Why was everyone quiet about losing their honor when Afghan groups led by Haqqani etc. were openly operating in Pakistani territory and establishing their “emirates”? Obama-Zardari-Karzai Summit: What Should They Be Saying To Each Other?